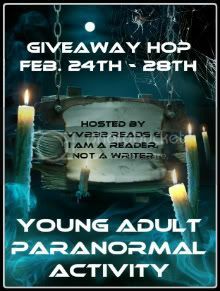 For the Young Adult Paranormal Activity Hop hosted by I Am A Reader Not a Writer, you can win your choice of book up to $12 from either Amazon, or Book Depository. Open to where ever Book Depository ships. See the LIST OF ALL PARTICIPATING BLOGS and their giveaways. I don't know which is longer- My TBR list or my wish list. It seems like they are both pretty even at this point, but with the new releases which seem to hover around the same date the wish list goes down and the TBR list goes way up!! thanks for the giveaway. Wow! Awesome giveaway! Thanks K Team! Don't forget my Dragonswood Giveaway! Great giveaway! You all rock! Thank you so much Kirk family!!! Thank you so much for participating in this hop and for the great giveaway chance! Thanks so much for the awesome giveaway! I am a new follower and excited for the chance to win. Fingers crossed!